I started my marigold scarf yesterday. The pattern is called A Little Bit Bohemian. The designer is Rebecca Stromgren. When I am going to be knitting an item with a pattern repeat and one where I also have to count the number of rows and stitches, I create a spreadsheet to help me stay on track. There is nothing more frustrating that getting halfway through the project and realize that the stitch count doesn't add up correctly. Today, it seemed to take me so long to create the spreadsheet. I was getting very frustrated. After all of that time and effort on the spreadsheet, I remembered that I had an app on my iPad to do just that. It's called Knit-N-Count. It works really well. Joey was a New York Giants fan. On Sunday, Dec. 4 2011, the day before he passed away, he asked to be helped into his bedroom so that he could watch the game. The Giants were playing the Packers. Halfway through the game, Joe slipped into a coma. The Giants lost by 3 points. I have never been a football fan. It always seemed like a bunch of loud guy noise to me. That day though, I watched most of the game with Joe. The hospice nurse kept telling us that even though he was not responsive, he could still hear us. Apparently, today is an important game for the Giants. I have been more sad than usual most of the day. Ross is watching the game in the other room. I can't bear to. The memories are just too painful. So instead, I will be knitting my scarf, hoping that the bright marigold yarn will drown out the noise of the blues. I miss my son so much. Right now even more so. Mary brought Vera to stay for the week. Mr C. and Lucietta came to bring me a wedding invitation for Sunday. Joey's Giants defeated my Niners. I got over it. I hope that the knowledge that Joey's good guys won, helps you. You have to grab onto whatever you can. I like both your knitting project and your strategy, Lynda. The scarf is such a pretty color and, if you stay in focus with the knitting, it can get you through the toughest moments. That's what painting can do for me. The scarf is beautiful, so cheerful. I hope it gives you some happiness to knit on it. I really admire how strong you are. 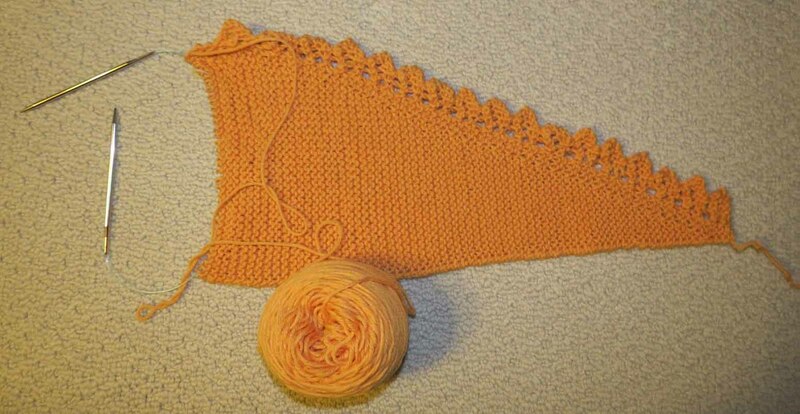 As for your marigold shawl, I am making one that is similar and it too is yellow, but more of a soft butter tone. Pattern is called Chinook, easy to follow and fun too.